The mist over the White River begins to burn off as the sun rises. Clint holds a freshly-caught trout. Driving into the welcoming confines of Gaston’s White River Resort transforms whatever rig you’re driving into a time machine. Gaston’s is nostalgia come to life, a summer camp for all ages, set to the ancient soundtrack of the gurgling White River. From the neat rows of riverside cottages to the general store-like feel of the Welcome Center lodge to the decades’ worth of antique fishing paraphernalia in the restaurant, they just don’t make ‘em like this anymore. Judging from the number of families that have themselves been coming here for multiple generations, it’s obvious Gaston’s is special to its clientele, too, something not lost on the current ownership. Gaston’s has been witness to these moments for 60 years. Some things have remained constant over that time—the river, the fishing and the level of service, mainly. Other things are dramatically different, such as the corporate groups booking the on-site conference center or the number of families who come out here more interested in the scenery and quiet than actually dropping a line. The original cottages are still tiny and pink, but there have been plenty more accommodations added over the years, including those geared toward the groups and family get-togethers that have become commonplace. The resort even hosts a dozen or so weddings annually and holiday traffic continues to grow. Four years ago, 400 guests enjoyed their family Thanksgiving gathering at Gaston’s; last year it was nearly 1,000. Recognizing such trends and capitalizing on them are what Gaston sees as vital for the business to remain relevant in a society dominated by video games and mile-a-minute entertainment. Half of the resort’s marketing budget goes to social media and digital advertising, something that was almost non-existent a couple of years ago. The strategy has paid off, with more people coming to the resort after seeing it on Instagram and Facebook as compared to, say, in Field and Stream. And that growth, combined with the long-timers, is adding up to 2018 being something special. 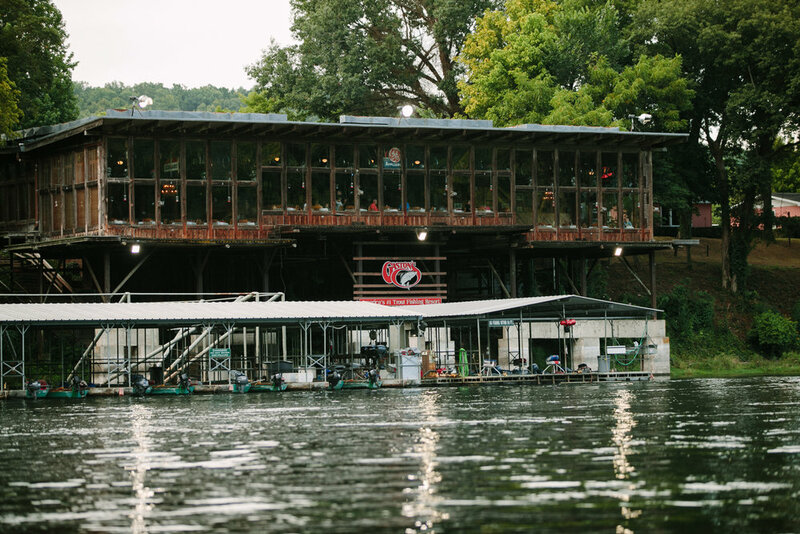 It’s likely Al Gaston, owner of a Kansas-based construction company and Clint’s great-grandfather, couldn’t have imagined what would eventually spring from the 20-acre side business he launched in 1958, complete with six boats and a clutch of six small cabins—and those cabins are still in operation, by the way. Clint’s grandfather, Jim Gaston, was tapped by Al to manage the property, and it was under Jim’s visionary leadership that Gaston’s became the institution it is today. Throughout the 1970s, 1980s and into the 1990s, land and amenities were added to broaden the resort’s appeal, improve access and lengthen stays from a day’s fishing to weeklong vacations and retreats. At last count, Gaston’s encompasses 400 acres, 79 different accommodations and 70 boats at a state-of-the-art dock. A 3,200-foot airstrip allows anglers from all over the country to fly in to fish and dine in the 300-seat, award-winning restaurant. Tennis courts, a playground and game room, nature trails, a swimming pool, along with a wildlife refuge and fly-fishing school round out the attractions and continue to broaden the resort’s clientele.